How many fire marshals do you need? A simple guide. ‘How many fire marshals do I need?’ is a question we often get asked by our business customers. In fact, the answer depends on the nature and size of your organisation. That’s why we’ve pulled together this simple guide to help you work out how many marshals you need in the workplace. Firstly, decide if you are a low risk, normal risk or high risk business. The level of fire risk in your business will dictate how many fire marshals you should have. One caveat here though: there is no legal definition of low, normal or high risk with regards to fire safety as it depends on many factors. If you feel unqualified to determine the risk level of your premises, or uncomfortable doing so, then check your Fire Risk Assessment, as it should have classified your premises for you. When calculating the fire risk of a premises we need to take into account two main things: 1) ‘hazards’ – how likely is it that a fire will occur, and 2) ‘severity’ – how damaging could a fire be if it did occur. Notes & Examples: only a small number of premises will fall into this category, examples being a stonemason’s workshop and some small shops and offices. Notes & Examples: most premises fall within this category e.g. bigger offices and shops, warehouses, and most factories and light engineering plants. 2) those where it would be difficult for the occupants to escape, either because of the nature of the occupants, such as in hospitals, care homes, childcare nurseries and schools; or because of the convoluted layout of the building, such as in some HMOs (‘homes of multiple occupation’). A stonemason’s has a workshop and a separate office area which manages its online shop. The workshop employs 7 people, including 2 who work on the weekend. The office employs 3 people, who work Monday-Friday 9am-5pm. A large office building has 3 floors, a cafeteria and a reception area. There are 280 employees in the offices, 90-100 on each floor, 15 people in the cafeteria working 2 shifts, and 5 people working in the reception area. A busy restaurant has a kitchen and a dining area. The kitchen has 30 employees working 3 shifts, and the dining area has 8 staff working 2 shifts, plus seats up to 40 customers. Hopefully now you have a clearer picture of how many fire marshals you need. Your fire marshals are a key part of your fire safety plan and have a number of important duties which will help keep your employees and customers safe from fire. Find out more about what a fire marshal does here. 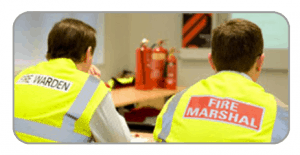 Find out about our Fire Marshal Training course here.